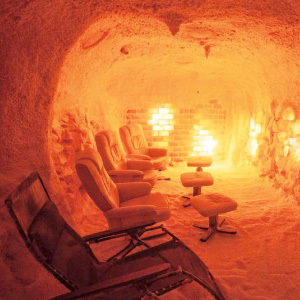 Salt therapy is a drug free treatment that reproduces the natural micro climate of a salt cave by dispersing a dry salt in high concentrations in a salt room whose surfaces are covered with layers of salt. This is a highly effective therapy for treating people with respiratory problems and skin conditions without any known side effects. Himalayan salt has long been known for its anti-inflammatory and anti-bacterial properties as well as helping to loosen mucus and phlegm. People with chronic upper respiratory conditions, asthma, allergies, sinusitis, bronchitis and skin disorders can derive significant benefits from salt therapy. Actually, just about anyone can benefit! Where is the salt cave? Our Himalayan salt therapy salt cave is located on the corner of Smith Street, Mooloolaba. For more information about our Salt Cave, contact and booking details, please visit our contact page. You can call or make and appointment request online from your desktop or phone. Salt Caves have a range of prices and packages to suit everybody, whether your just coming in for a single session to kick back and relax or for regular treatment for a specific condition. Prices start from $25 for children and babies are free (with a paying adult). Give the benefits of salt therapy through our Gift Vouchers — a healthy and relaxing gift.